Nature has its way when it comes to the maternal bond between moms and their babies. This bond begins to develop during pregnancy. However, childbirth is the period where the relationships really set in, this is not only peculiar to humans, mother dogs also share great bond with their puppies. If you are a dog owner or dog lover, I bet you have something to say when it comes to affection and devotion that a mother dog displays toward her puppies. Apart from the sense of serene pleasure that emanates from the proud mama surrounded by her litter, dog mothers express their affection toward their puppies by displaying several maternal behaviors. Check out this adorable video of mother dogs and their cute litter. 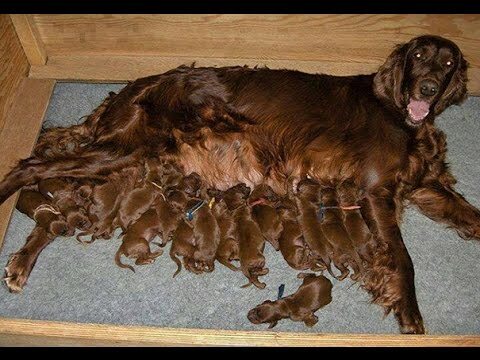 DoglopedixNature has its way when it comes to the maternal bond between moms and their babies. This bond begins to develop during pregnancy. However, childbirth is the period where the relationships really set in, this is not only peculiar to humans, mother dogs also share great bond with their puppies.